With word that Stargate Universe's demise means the Stargate Atlantis movie is no more (raise your hand if that was a surprise), fans may be down in the dumps that their favorite flyboy won't be returning to Atlantis. But never fear, because the man who portrays him is doing just fine and getting a lot of work in front of the camera. If you're looking for some more science fiction, you can check out Flanigan's SyFy Original movie The Other Side coming out this year. Filmed in Ireland, Flanigan plays Colonel Sam Synn leading a group who gets caught up in an experiment gone wrong. While the device they are observing is meant to simply glimpse other realities, it instead transports them to an alternate reality where man-eating creatures roam. Yes, it follows the SyFy Original tradition of big monsters. But if Westerns are more your speed, the anxiously awaited Good Day For It should soon be coming out of post-production. Forced out of town after betraying a gang leader, away from his wife and child for fifteen years, Luke returns to see his ailing daughter. Tensions rise as old enemies come seeking a fight and Luke must stand up for what he holds dear. The movie stars Flanigan alongside Robert Patrick, Hal Holbrook, Robert Englund, Lance Henriksen, and Christian Kane. With a cast like that, it's bound to be a treat! 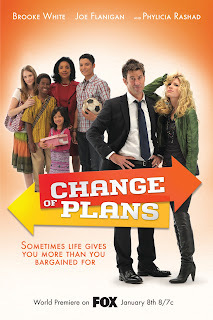 And if you can't wait that long for more Flanigan screentime, tune in this Saturday for his movie Change of Plans, which is a part of the team-up between Wal-Mart, Procter & Gamble, and Fox to promote “Family Movie Night.” The movie, which most notably stars Flanigan, Brooke White, and Phylicia Rashad, sets up the typical “instant family” dynamic. Sally Danville (White) is a musician and her husband Jason (Flanigan) is a fighter-pilot. They're young, care-free, and not looking to be tied down by anything. But that wouldn't make a very dramatic movie, now would it? Instead, they are forced to adopt four children, three who come from third-world countries, when Sally's best friend from college dies quite suddenly. Handed with these new responsibilities, they must learn to be a family and what that means. The premise is what one would expect from such a genre, but a cheesy, feel-good movie isn't so bad once in a while. Besides, if this could be a pilot launching point for a continuing series, fans can't complain. The prospect of more Flanigan is never a bad thing, especially if he's keeping his Air Force wings.